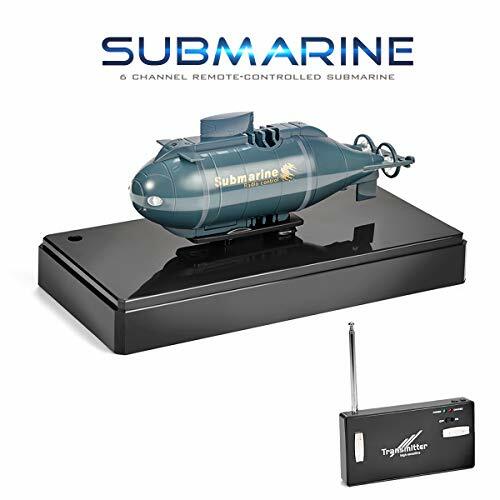 Are you having a tough time trying to find the best remote control submarines? If so, you’ll want to check out this review on what the best options have to offer. A buying guide section is also available at the end to provide you with additional information. By the end of this post, you’ll be feeling confident about the sub toy that’s best for your child. 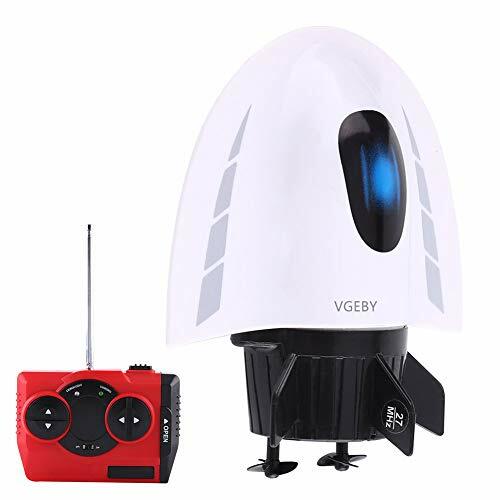 The ThorRobotics RC Submarine toy comes with a fantastic camera that’s able to take images with a pixel quality of 1280 x 1024. This ensures that children are able to use this submarine toy underwater to take HD pictures. We liked how there’s a 2.4Ghz remote control included. It enables multiple submarine toys to be played with at the same time, which makes it more exciting. This group play can also be effective for improving your child’s social skills. The hull has been constructed using high grade ABS materials. In addition to this, it’s IP68 class waterproof, which means you can feel confident in knowing that it will last your child for a long time. Kids have been loving how they’re able to take HD pictures and use the submarine to play with other kids and their water toys. It’s awesome for their social skills. This Remote Control Submarine provides kids with the ability to explore more underwater. It can be used in a pool, bathtub, or lake, which enables kids to get adventurous and creative with how they play with it. The remote control has a distance of 4 meters and allows children to play with it for around 8 minutes of continuous play after being fully charged. It takes approximately 10 minutes to fully charge, which can be done easily as a result of the USB input. It can go as deep as 50 cm and features a high grade propeller that works to power the submarine toy. Kids are able to control the toy in any direction they like as well. This is a great toy that lets kids play with it at depths of 50 cm in pools, bathtubs, or lakes. Since it doesn’t work great in deeper water it pairs well with RC boats that their siblings or friends may have, allowing them to play in group with different types of RC toys. The Kids Mini RC Toy Submarine comes with a battery that can be easily recharged. This is a result of the USB input that’s available. Moreover, we were impressed with how it’s able to provide kids with a maximum of 20 minutes of continuous play after being fully charged. We also liked how the remote control that they’ve included has a 6-channel feature and a range of buttons that provide kids with the freedom to move it in any direction they like. this included being moved up and down, as well as left to right. Moreover, the size of the remote is perfect for smaller hands. Therefore, you can be sure that your child will be able to have easy control over their submarine toy. Children have been having a blast with this one because of how easy the controls are to use. The 20 minutes of continuous play that’s available is another great feature that lets kids play for good amount of time. The Jujuism Mini RC Submarine comes with 2 LED lights that are available at the front and work effectively to show you where the toy is when it’s darker. This feature is also more exciting for kids and encourages them to play with more creativity. We liked how they’ve implemented 2 rubber drain plugs as they work effectively to get rid of any water that may have seeped into the toy. There are waterproof ABS plastic materials included too. As a result, you’re able to keep it more durable. As soon as the toy gets in the water, it powers on, and when it’s out of the water, it automatically turns off. 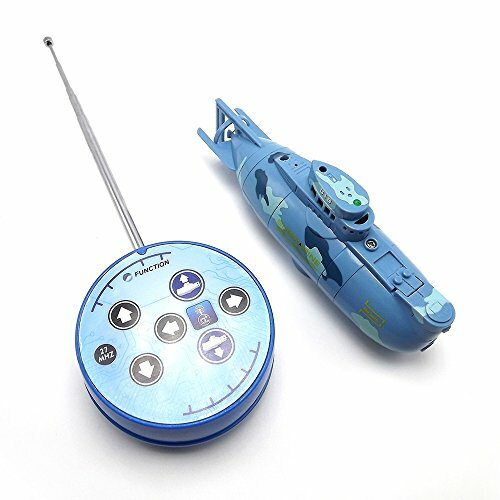 The remote that’s included has a 6-channel design that allows kids to control the submarine up, down, left, and right. There’s a specific propeller involved in making the toy dive and rise, as well as other propellers that focus on moving it in different directions. The 2 rubber plugs that are available with this one allow you to easily drain any water that may have gotten inside. Kids have also been loving how they can see the LED lights when the toy is underwater. 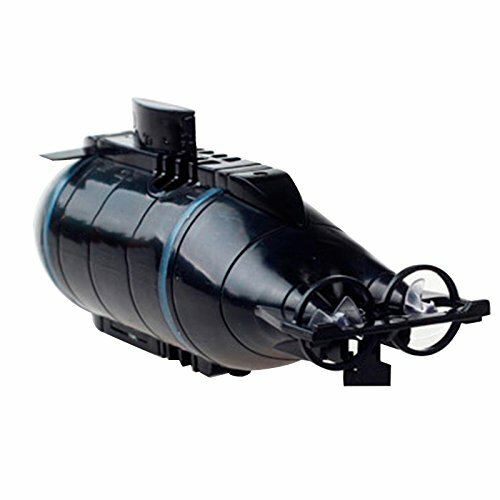 This EUDAX Mini RC Submarine has been created with a great design that makes it look like a real submarine. So, when kids are playing, they’re able to have a more realistic experience, which can be great for their creative thinking skills. While kids are using the remote to control the toy, they’re also provided with the chance to develop their hand-eye coordination and motor skills. You’re able to be up to 5 meters away from the toy and still have total control over it. Kids are also given the freedom to move in in any direction they like. After being fully charged, the toy is able to last for 15-20 minutes of continuous play. This is plenty to keep your kids engaged for a while. We liked how the charging system is easy as a result of the USB cable and input that’s available. 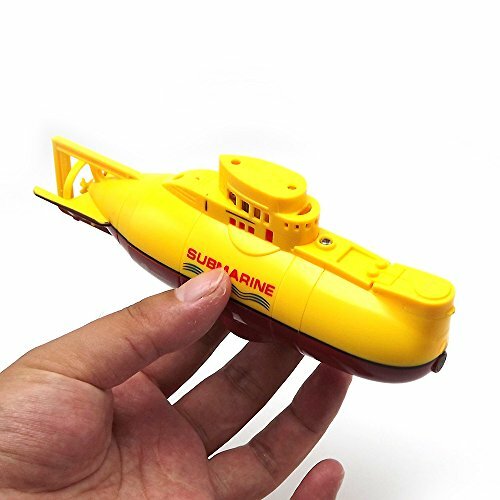 This is an awesome submarine toy that helps kids to improve their coordination and motor skills while using the control, as well the ability to play with more creativity. The Tipmant Mini RC Submarine features a battery that can be easily recharged. This is because it comes with a USB charger which makes it hassle-free. After being fully charged, the toy is able to last for 15-20 minutes. This is plenty of time to enable kids to have a blast. The remote that’s available provides them with total control over the toy. They’re given the freedom to control it upwards, downwards, left, and right – they can also choose to make it float. Having all of these options available is awesome for your child’s creative thinking skills. Using the remote can also be an effective way to help them develop their motor skills and hand-eye coordination. Kids have been loving how they can control this toy in a variety of ways as it encourages them to be creative. Handling the remote is also excellent for their coordination and motor skills. This Mini RC Submarine Toy by Liberty Imports features a range of 3 speeds for kids to choose between. Children have been liking how they’re able to have this selection as it lets them play with more freedom, which is great for their creative thinking. They’re able to move the submarine in all directions, while even being able to make it float. In addition to this, there’s a light control available too. This works effectively to light up the toy when it’s under water for you to clearly see it. It’s also more exciting to play with due to these lights. We also liked how there are 3 frequency bands available that let 3 people race their submarine toys at the same time. This is a great opportunity for children to develop their social skills while playing in groups. This is an exciting submarine toy due to how there are lights and the ability to race other submarines. It stimulates your child’s creative side and can improve their social skills. Egolife’s RC Mini Submarine has a fantastic design that makes it look like a real submarine. This design feature makes it more realistic for kids to play with, which is great for their creative thinking skills. We liked how using the remote to control the toy helps kids to develop their hand-eye coordination and motor skills too. They can use the controls to make the submarine dive and rise back to the surface, as well as move it in any direction they like. Due to the USB input that’s available, you can be sure to charge this one easily and without any hassle. The realistic design available with this one helps kids to play with more creativity and the remote works effectively to develop their coordination and motor skills. The eMart Kids Mini RC Sub features a battery that can be easily charged by using the USB cable that’s provided. After it has been fully charged, kids are able to play continuously with it for 15-20 minutes. By using the remote, they’re able to control the toy to dive, rise up, float, and move in all other directions. As a result, they’re given the freedom to play with it how they like, which is great for their creative thinking skills. We also liked how the remote is easy for children to use. Therefore, they’re given the chance to develop their hand-eye coordination and motor skills. Kids have a blast being able to make this toy float, submerge underwater, and move in all directions by using the control. It helps them to be more imaginative and develops their motor skills and coordination. 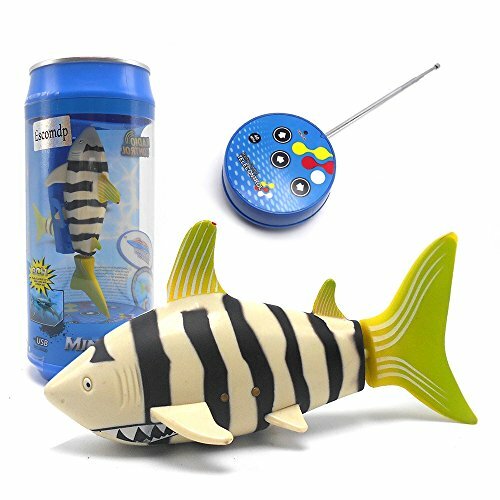 This Escomdp Mini RC Fish Shark is a more unique submarine toy due to its design. It has been made to look like a shark, which children have been having a lot of fun with. They can use the remote provided to control it in any direction that they like. The design and ability to have freedom while controlling it inspires kids to be more imaginative, which is great for their creative thinking skills. We also liked how children are given the opportunity to develop their motor skills and hand-eye coordination by using the small remote. They can be standing up to 5 meters away from the toy and still have total control over it. furthermore, the USB charger cable makes charging this one a breeze. After being fully charged, it can last your child for 20 minutes of play, which is plenty to keep them entertained for a while. We liked how this one has a unique shark design as it encourages children to play with more imagination. 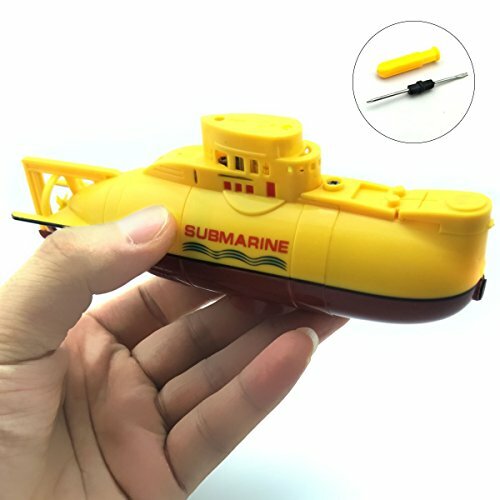 This submarine toy has been constructed out of high-quality ABS materials. Therefore, you can feel confident in knowing that it will last your child for years to come. We were also impressed with how you can be standing up to 6 meters away from the toy and still have total control. Using the remote to control this toy is a fun and effective way to help your child develop their hand-eye coordination and motor skills. They’re also given the freedom to move it in any direction that they like. As a result of the streamlined design, it’s able to travel at fast speeds and run smoothly underwater. It’s also resistant to capsizing while underwater, which is a great feature for kids who are beginners to these kinds of toys. We liked how this one has been created with a streamlined design as it lets kids control it as faster speeds, which is a ton of fun. 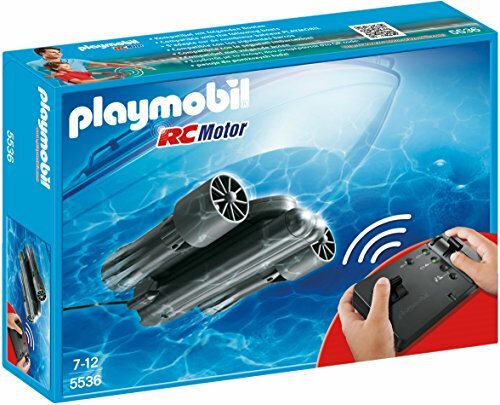 The PLAYMOBIL RC Underwater Motor comes with an excellent remote that provides kids with complete control over the toy. They’re able to use the remote to move the underwater toy in different directions. This is a great feature that helps them to play with more creativity. Furthermore, using the remote is awesome for developing your child’s hand-eye coordination and motor skills. In addition to this, children feel encouraged to use the toy to explore underwater areas. As a result they’re able to play with it in more imaginative ways, which is great for their creative thinking skills. 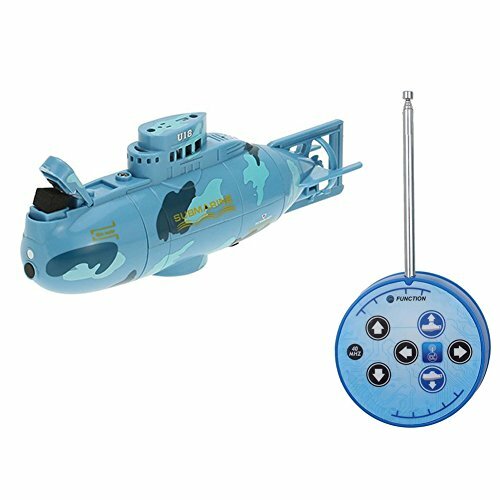 Children have a lot of fun with this one and using the remote to control where they want to explore underwater. It’s excellent for their imaginative thinking side. 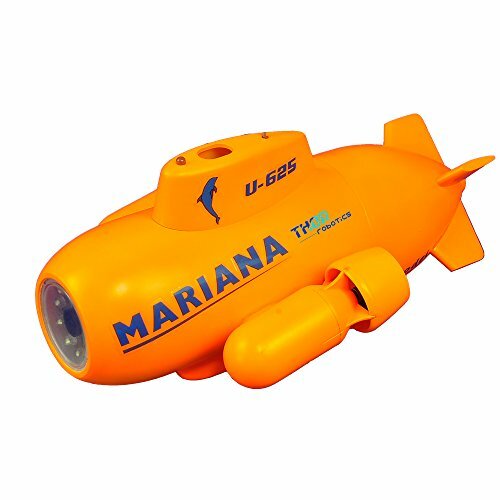 Now that you have a better idea of what the top RC submarine toys have to offer, you can begin to narrow down your search to find the one that you think your child would enjoy the most. However, don’t worry if you’re still feeling 100% confident on which one to pick yet. We’ve put together this buying guide section to provide you with additional information to help you feel fantastic about your final decision. After reading through this review, you will have seen that there are a few different types of submarine toys available. In order to help you distinguish the differences between each type, take a look at the section below. 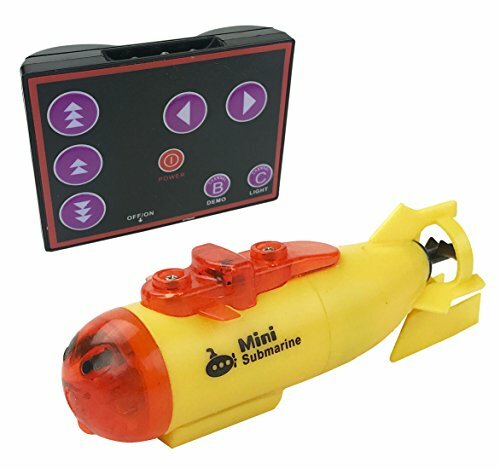 There are a number of remote submarine kits available that provide kids with the change to build and play with their toy. The construction process is excellent for their problem-solving abilities, as well as their hand-eye coordination and motor skills. We’ve included a submarine toy that has a camera in this review because kids have an absolute blast with these kinds of toys. They’re given the chance to take some awesome HD images of things underwater which is incredibly exciting. The camera feature also encourages kids to explore more while playing with the toy and want to be outdoors often. The shark submarine toy that we have reviewed in this post is a more unique option that enables kids to have a lot of fun. Due to the shark design, children feel inspires to use it to play in more imaginative ways, which is awesome for their creative thinking skills. While taking a look at the various options in this review, you may have noticed that there are some common benefits that these toys can have for kids. If you were interested to learn a little more about these benefits, take a look below. 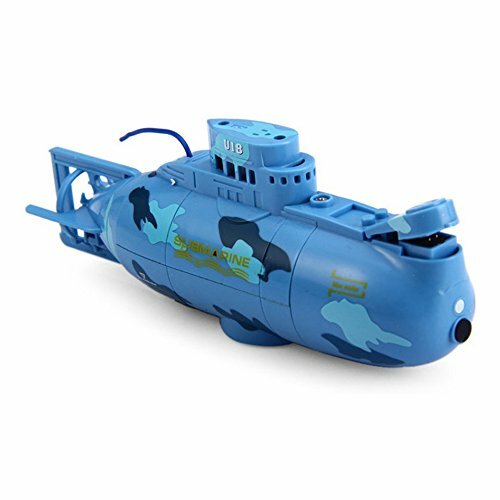 Submarine toys that have a realistic design are great for elevating the playing experience for kids. They’re encouraged to feel like they’re controlling a real submarine, which is excellent for their imaginative playing abilities. Moreover, the shark submarine toy is another option that inspires children to play with more creativity. The design of the shake is fun and exciting for kids to play with. So, these sub toys allow kids to think in more creative ways, which can be effective when it comes to coming up with solutions to problems later on in life. The remote submarine toys that we’ve reviewed here are excellent for kids because the size of the remotes are great for little hands. Therefore, kids are able to easily control their toy and have fun. However, being able to get a good grasp on the remote to control their toy is also effective at developing their hand-eye coordination and motor skills. Furthermore, there are options in this review that allow multiple sub toys to be played with at the same time. This provides kids with the opportunity to play in groups and develop their social skills. So, that concludes our review on the top radio controlled submarines that are available. Be sure to read through the main features, pros, cons, age recommendations, and what makes each one stand out. The buying guide section also provides you with further information that can be useful. Everything you need to know about sub toys can be found in this post!